TRADOLOGIC strengthens its position as a leading binary option platform provider by partnering with leading sports betting brand SBOBET. 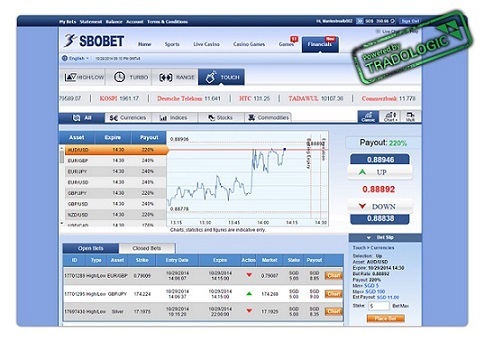 October 2014, TRADOLOGIC, the international designer, developer and licensor of software and services for the financial and gaming industries, is proud to announce that the global online gaming brand SBOBET has launched its new financial binary betting offering utilizing the TRADOLOGIC platform. SBOBET has launched the TRADOLOGIC financial binary betting products under both its Isle of Man OGRA license and Philippines CEZA-First Cagayan license. SBOBET is a global leader in Sports Betting, specializing in Asian Handicap betting. SBOBET offers over 500 sporting events every week, extensive coverage of all major football leagues and international sporting events. SBOBET also provides live football updates, immediate winnings confirmation, rapid payouts, easy access and fast online betting available around the clock. SBOBET Casino is a one-stop entertainment site offering an extensive range of casino games and the highly-rated Multi Player Live Dealer developed with the latest technology tools and stunning visuals to satisfy every player’s needs.